The issuing of the 50 Dime Roosevelt silver coins began in 1796 and continues even in our present times. The dime is another name for the ten cent coin and another popular dime among silver investors is the Winged Liberty Head dime. Each silver coin from the 50 Dime Roosevelt silver coins sets has a respective fineness of 90.00% pure silver, the other metal from the alloy being copper in proportion of 10.00%. Each of the coins has a small weight of 2.25 grams and since we are talking about a set of 50 Roosevelt Dime silver coins, the overall weight of the package amounts to 112.50 grams of pure silver. Also related to the characteristics of the 50 Dime Roosevelt silver coins, each bullion coin has a diameter of 17.91 mm and a 1.35 mm thickness. 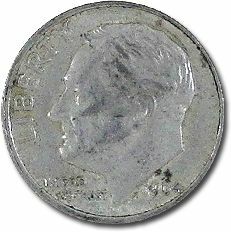 The 50 Dime Roosevelt silver coins illustrate on the obverse the portrait facing left of Franklin D. Roosevelt. It was a coin minted to honor this great American President mainly for founding the National Foundation for Infantile Paralysis, which will later be entitled the March of Dimes. It is a touching story that makes this little silver coins really special. This design for the obverse of the 50 Dime Roosevelt silver coins was realized by John R. Sinnock. The inscriptions present are IN GOD WE TRUST and LIBERTY. The reverse of the 50 Dime Roosevelt silver coins depicts a torch symbolizing liberty, an olive branch which symbolizes peace, and an oak branch with the meaning of victory. The face value of ONE DIME is inscribed at the bottom and at the top is the issuing country UNITED STATES OF AMERICA plus the motto E PLURIBUS UNUM. Therefore, through the 50 Dime Roosevelt silver coins our website offers investors and individuals around the globe the opportunity of investing into a quantitative number of bullion coins. This package offered by our website contains 50 silver bullion coins with the face value of ten cents, or a dime as it is also known as. No matter the year in which the 50 Dime Roosevelt silver coins were issued, taking into consideration that their minting started a long time ago in 1796, their value is established in the same way: to the price of silver is added a small premium. We could not state that the 50 Dime Roosevelt silver coins are a very big attraction for collectors, except for those that are really passionate by the years in which Roosevelt was the President of the USA. This is due to the fact that large quantities were minted throughout the years and in general, collectors are more fascinated by coins characterized by a scarce mintage. However, we cannot contest the fact that the 50 Dime Roosevelt silver coins are a great asset if we were to think at the rapport that is established between the considerable quantity and the really affordable price of these American silver bullion coins.